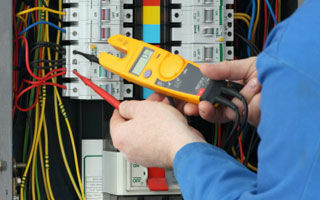 Occupational Health and Safety Regulations require that the person having control of a workplace or access to that workplace such as an employer, self employed person, main contractor, must ensure that all plug in electrical equipment and residual current devices (RCD’s) at the workplace are safe and appropriately inspected, tested and tagged by a competent and trained person (refer Table 4 AS/NZS 3760:2003 for testing and inspection intervals). A E Roberts Electrical can manage the periodic inspection, testing & tagging of your equipment and associated log records. Thermal image reporting is an invaluable tool for locating potential problems in electrical equipment, control panels and switchboards. In a production environment this can allow equipment repairs to be scheduled instead of the lost production/breakdown scenario, potentially saving thousands of dollars in down time. In addition, the insurance industry is now commonly requesting thermal image reporting on commercial and industrial switchboards as a prerequisite for insurability. We have the specialist staff and camera equipment required to comprehensively undertake this reporting for you.